Jack Whitehall’s got a bit of a hit on his hands with his new Netflix series, Jack Whitehall: Travels with My Father. The show introduced the rest of the world to Whitehall and left many asking about his love life. Who is Jack Whitehall’s girlfriend? She is an actress, and we’ve put together a small Gemma Chan wiki to get you up to speed on everything from her age to where to find her on social media. Gemma Chan, age 34, was born on November 29, 1982, in Guy’s Hospital in London, England. Her mom worked as a pharmacist at the same hospital, while her dad worked as an engineer. Her parents originally came from China. Chan’ mother is originally from mainland China and moved to Hong Kong before the cultural revolution along with her parents. From Hong Kong, the family moved towards the West with a quick stopover in Scotland before heading to Kent, England. Chan first went to Newstead Wood School for Girls, followed by Worcester College, Oxford, where she studied law. Upon graduating, the law firm of Slaughter and May offered her a training contract but instead, she decided to pursue her love of acting at Drama Centre London. This was a bit of a blow to her parents who wanted their daughter to have a stable career, according to Chan, her father even stopped speaking to her for three months. Chan first gained some recognition as a model on Project Catwalk (the U.K. version of Project Runway) in 2006. She was photographed in campaigns for companies like Selfridges and Nokia as well as magazines like Cosmopolitan and Elle. From there, she eventually segued from modeling to acting. Gemma Chan’s acting career began with small parts in shows like Doctor Who, The IT Crowd, and Sherlock before gaining a regular role on Secret Diary of a Call Girl which became a bit of a surprise hit and with her work on that series, Chan was off to the races as it opened the door to more acting parts both in television shows like Brotherhood, and movies like Fantastic Beasts and Transformers: The Last Knight. Currently, you can see her on the AMC/Chanel 4 show, Humans. 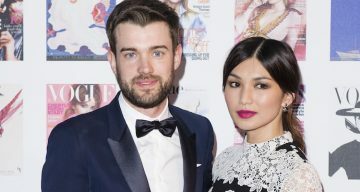 Gemma Chan and Jack Whitehall began dating in 2011 after meeting on the set of Fresh Meat, a U.K. TV show set around first-year students at a university. For their very first date, theywent to Nando’s, a popular chicken restaurant where they split the bill. The two have been a couple ever since and currently live together in London. Like most actresses of her age, the actress keeps up a couple of social media accounts which are flooded with Gemma Chan’s pics. You can find personal pictures, candid shots, behind the scenes pictures, and even old modeling shots on Gemma Chan’s Instagram. She is also on Twitter, which she regularly updates with her thoughts about everything from what’s going on in the world to behind the scenes of wherever she is currently shooting. Merry Christmas to the amazing staff & patients at @royalmarsden, it was great meeting you today ? Gemma Chan is gaining notice for her acting. She is happy with Whitehall, and has a popular television show on both sides of the Atlantic in Humans. You may want to start following her now so you can be in the know when everyone starts talking about her.